Another of my favorite things to do, which is most definitely not a recent discovery, is eat, especially at new restaurants. My favorite dining companions are my husband, my parents, and my best friend, when she's in town. I was out with my folks this weekend at a new place, and as I was snapping photos to share on Facebook, because I simply love food photography and also inspiring people to check out new places around town, it occurred to me that this could become a new blog series. And as I've resolved to update my blog at least once a week, here's the inaugural series post, the maiden voyage, if you will, of Tasty Omaha. This past Saturday, July 1st, I ventured to Timber Wood Fire Bistro with my parents. It was recommended to me by a friend who had lunched there a few times with her husband. 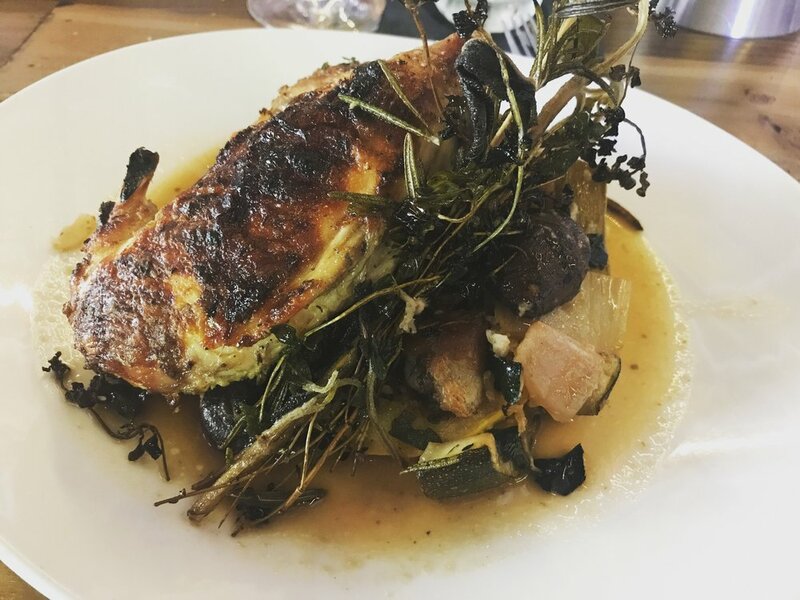 The bistro, owned by executive chef Jared Clarke (who you may know also owns the well-loved Railcar Modern American Kitchen restaurant) is located in a nondescript strip mall area at approximately 87th and Dodge, in Countryside Village. I wasn't sure what to expect and was intrigued by how low-key the exterior appeared (though in good company, with a Le Quartier bakery nearby, who also supplies them with their delicious bread, Starbucks, a delicatessen, and a "spirited" barbershop). The interior of the bistro is deceptively sprawling, with a choice to dine indoor or outdoor, and in addition to the main dining area--which can seat 40--there is also a smaller room that seats about half that. The decor is sleek and simple, with touches of wood embellishment. Each table has a small piece of wood that serves as the centerpiece. I made a reservation on Open Table (which, I love any restaurant that uses Open Table!) for six o'clock. We arrived a quarter to, and were seated immediately, as there were only a handful of other patrons there at the time. And we sat. And sat. And sat some more. We'd been sitting for about fifteen minutes before the wait staff noticed us. Then we were given water and asked for our drink orders--I like to try craft cocktails from restaurants in particular, so I opted for a pear mule, while my mother opted to try their version of an Old Fashioned. We also ordered a bottle of wine. For an appetizer, we ordered the bread service--Le Quartier sourdough with herbed butter and olive oil--and the Timber Fries, which came with crispy mushrooms, tossed in truffle oil, topped with chipped beef and chive cream. We received our appetizers before we got our drinks, interestingly. And in fact, we waited another fifteen minutes or so before the bottle of wine we ordered as well was uncorked and delivered to our table, despite sitting on the bar for at least ten minutes. When I inquired about our drinks, the waiter admitted that he'd forgotten to put the order in, so we ended up simply cancelling them and sticking to wine. If it were crazy-busy? Totally understandable and no big deal. But as I mentioned, it was not busy. And the amount of wait staff they have in comparison to the number of patrons that were there could have easily provided two waiters per table. The bread from Le Quartier was absolutely fantastic. Drizzled with olive oil and warmed in a canvas pouch on the grill, the outer part of the bread was crispy, and the flesh of the bread was soft. The sourdough twang was mild but noticeable, and the herbed butter was the perfect accompaniment. Those folks at Le Quartier never disappoint. The Timber Fries came to the table looking like a daunting, glorious, fried dream. Upon first taste, the chive cream--like crème fraîche--was light and airy, providing a nice neutrality to the extremely salty fries and mushrooms. I also could not taste the truffle oil at all. The flavor combination had the potential to be monumental, but the fries and mushrooms were slightly overcooked, and the saltiness was over the top, even for fries and fried mushrooms. I also ordered the French onion soup, to see how they do this classic soup. According to the menu, the soup is made up of cognac, bone marrow, roasted local beef stock, and Swiss cheese. Cognac? Bone marrow? Yep, I'm game. The broth was, despite these tasty ingredients, bland. It was as though they used all the salt on the fries and had none left over for the broth. I couldn't make out the cognac or the richness of bone marrow. The cheese globbed up to a rubbery consistency on top of the soup and there was a blob at the bottom, as well. I'm not sure, but I doubt it was hand-grated. Quality off-the-block cheese has an entirely different texture than bagged cheese. The best part of the soup were the onions and the piece of baguette at the bottom, which soaked in the broth, making the flesh delightfully soggy, while the crust retained it's firmness. As the name suggests, the menu comprises a variety of offerings all prepared in/on a wood-fire grill. When I hear wood-fire, I immediately think of pizza, and Timber has a selection of pizzas that are baked on French bread in amoeba-like shapes and topped with things like poached pear and prosciutto, lamb kabob and herbed goat cheese, mushroom and fennel sausage, pepperoni, organic tomato, and stracciatella. Did we get pizza? No. Should we have gotten pizza? Yes. After much deliberation, I ordered the Prohibition Black Chicken (as I'm working on a Prohibition novel, anything that hints toward that era strikes me as a sign, so I go for it). Mom got the Cedar Planked Steelhead Salmon, while Dad got the Wood Roasted Short Ribs. When my plate arrived, it came with a breast, a drumstick, and a thigh. There was a bed of fire-roasted veggies, and a scoop of potato rosti. It was decorated with a fragrant bundle of wood-fire herbs, which I thought was a nice garnish. The drumstick and the thigh were perfectly cooked, tender, but nothing particularly noteworthy in terms of flavor. The menu states that the chicken is "cabernet cured" but I couldn't taste those flavors at all. The breast was entirely overcooked, to the point of inedibility. The veggies--carrots, celery, green and yellow squash, and mushrooms--were overall decent, though the carrots were hard and the celery was tough. The squash and the mushrooms were fantastic. The potato rosti struck me as au gratin hash browns--nothing more, nothing less. Tasty, but underwhelming. I sampled my mom's salmon, and it was glorious. The Asian-inspired glaze overflows with flavor, but her complaint was that the interior of the salmon was not cooked enough to her liking. My dad's short ribs, accompanied with baby bok choy, were unimpressive. I found the rib to be mostly fat, and the meat underneath to be tough. For dessert, we ordered the S'Mores Budin. Budin is a Latin bread pudding, but what arrived was basically, a rich fudge pudding with a graham cracker crust. According to the menu (desserts are not listed on their website, and neither are cocktails, for some reason), sea-salt caramel and peanut butter were to have been involved as well. I got hints of these flavors along the side where the crust was. The outer part of the fudge was delightfully warm and melty, but the interior was a cold block of fudge. I'm not sure if it's meant to be served that way. As well, it comes topped with two toasted marshmallows, but the further into the marshmallow I got, I discovered that it was just the skin of the marshmallow that was toasted, as opposed to toasting it so that the entire thing becomes melted and soft--like it would be over a campfire. Overall I was underwhelmed with the quality of the food and the service. The wait staff was very friendly and kind, but their speed and efficiency needs to be developed. The restaurant opened at the top of the year, and it seems like these sorts of kinks should have been worked out by now. I would be willing to try this place again for the pizza alone, as several passed our table, and they looked impressive, and Yelp reviews are enthusiastic for Timber's Sunday brunch. However, in my opinion, the food needs finessing and flavors need to be developed to live up to the potential that emanates from the menu. Particularly a dish like the Prohibition Black Chicken, which by the waiter's admission, is one of the most popular items on the menu.